If you have a stand alone PC which doesn’t has an Internet connection and you have installed nod32 antivirus, nod32 antivirus will not be able to download update for the signature so you have to update the virus signature database manually. 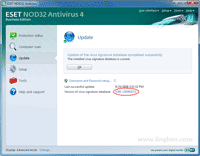 Otherwise, your PC may be at risk of virus attacks.On this example, I show how to update virus signature database of nod32 antivirus version 4 business edition. 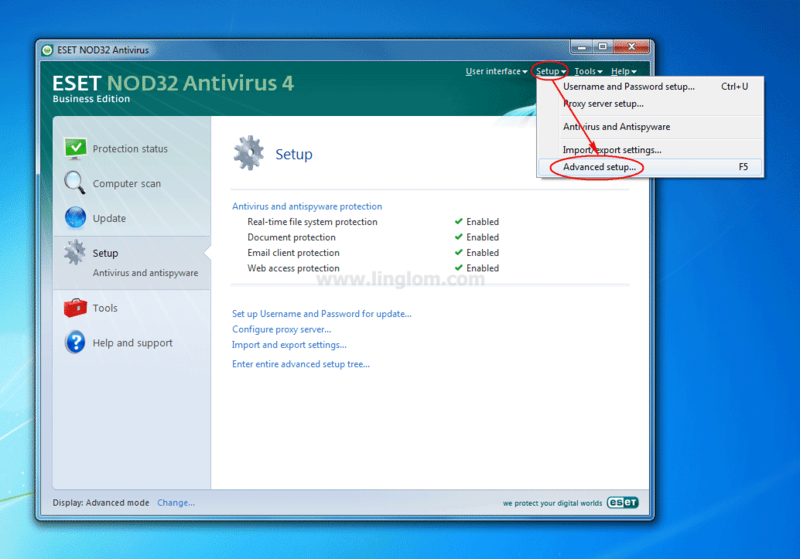 You also can apply these steps to nod32 antivirus version 2, 3 and home edition. But I have not include the update for version 2 so you have to find the update file somewhere else. 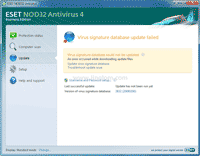 You see the virus signature database is failed to update on a stand alone PC. 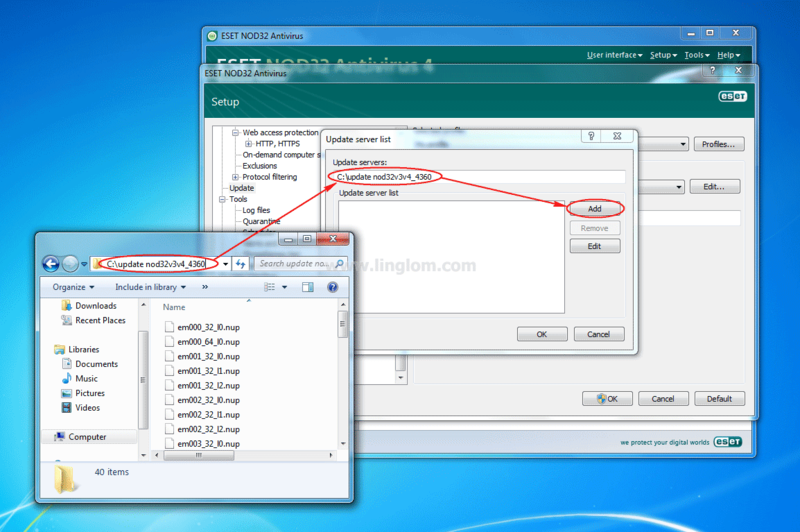 Extract the downloaded file to a folder. On this example, I extract to c:\. 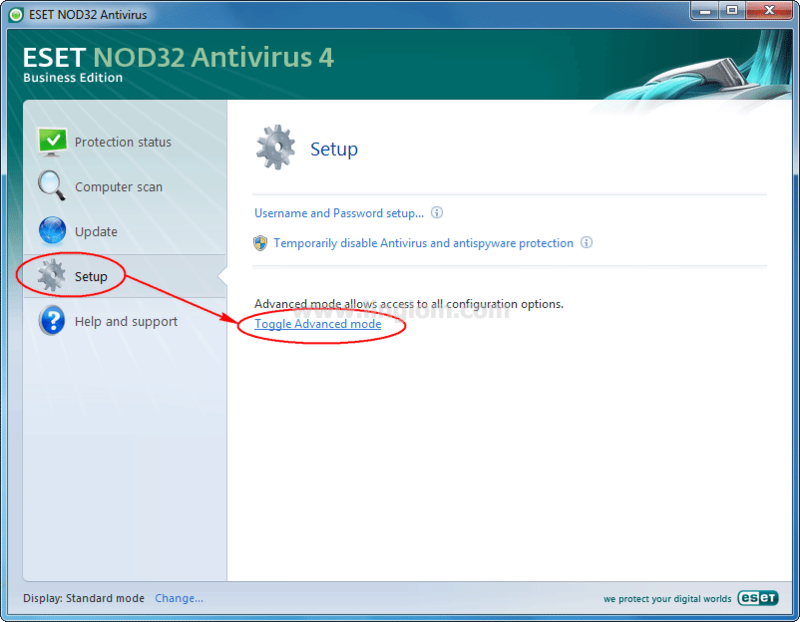 Open Eset Nod32 Antivirus, click on Setup -> Toggle Advanced Mode. On Toggle Advanced Mode, click Yes. 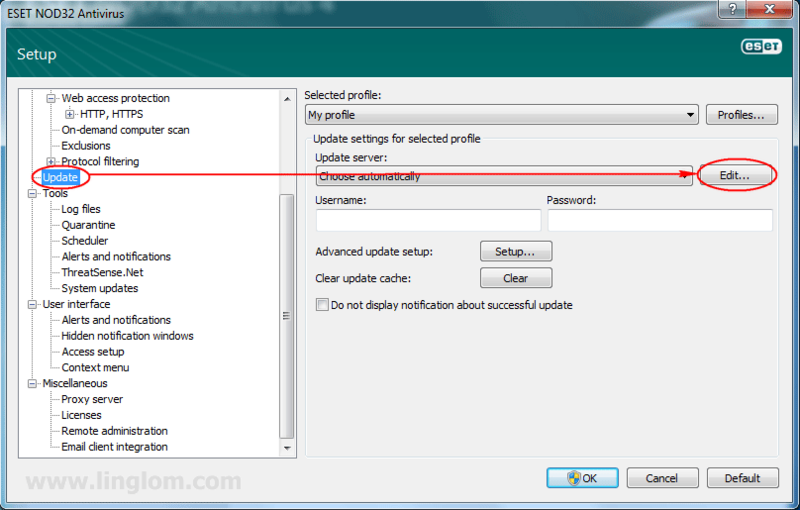 Open Advanced Setup window. Click on Setup -> Advanced Setup. Edit Update Server. On Setup, click on Update on the left menu -> Edit. 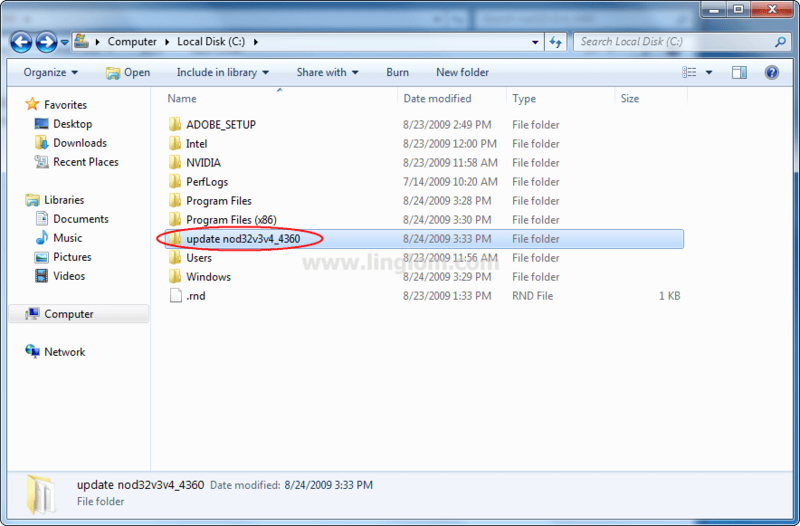 On Update Server list, copy the path from the extracted folder on step 2 to Update Servers box and click Add. 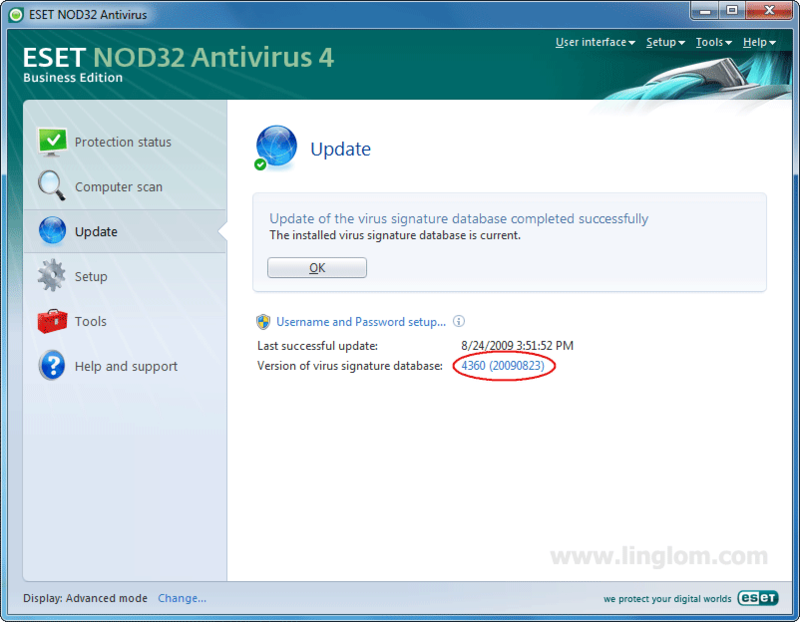 On this example, I copy “C:\update nod32v3v4_4360” and paste to Update Servers box. 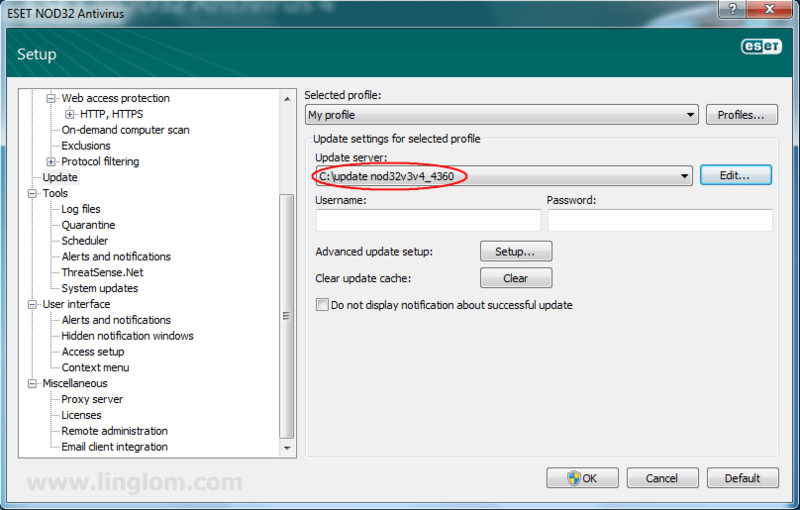 Then, click OK.
You notice that the value on Update Server box is changed. Click OK.
Click Update -> Update virus signature database. Now the virus signature database is updated. thanks for walking me through this. it still seems pretty complicated. my brother got vipre from http://www.counterspy.com and he thinks it’s easier than eset nod. 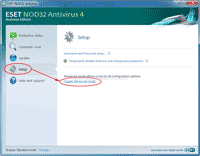 have you done any comparisons on both antivirus programs? pls advise. thnx! I have never tried vipre yet so I can’t compare these products. But I know that counter spy is one of the best spyware removal software. I think it’s worth a try. thank you. its really not easy trying to figure out which antivirus software to use when i still want to protect against everything that’s out there. its not that i am not ready to buy something, its just the time it takes to find out from others which antivirus software they are happy / unhappy with. i was thinking of going with counter spy but from their small site, i see they recommend vipre anti virus and i think i will at least do their trial for free. again, its hard to know so thanks for your suggestion. hai ling.this is prasad first of thanks to the your blog. i want to the nod32 offline update files there is no avaliable link.pls send where is available nod32 offline update files.thanks to the ling. 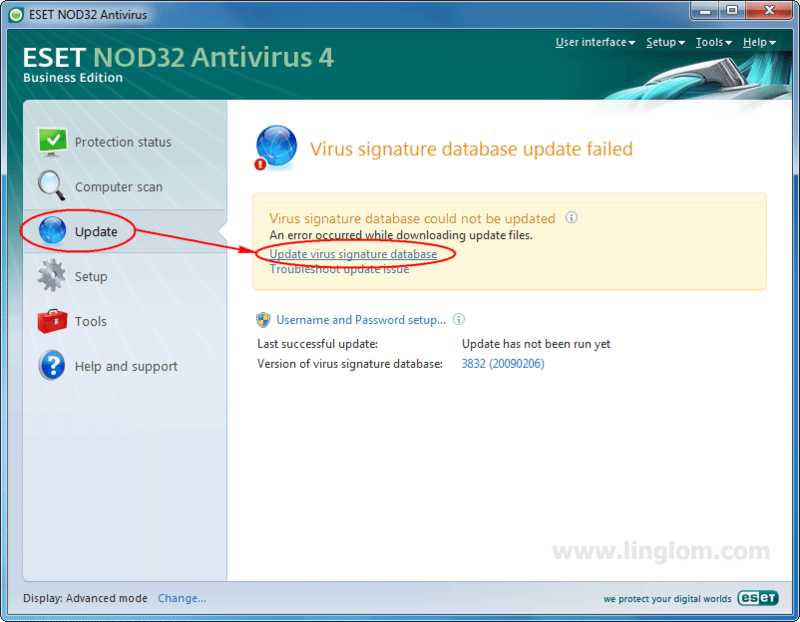 You can find Nod32 offline update at Virus Signature Update for Nod32 v3 & v4. Note: I do not upload the update regularly.